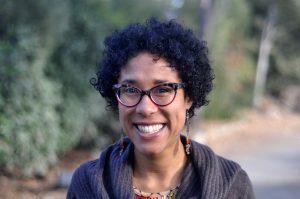 October 17, 2018 — Sarah Thompson Nahar, 2018 Generations Fellow at the Martin Luther King, Jr. Center for Nonviolent Social Change, will deliver the the 20th Annual Dialogues on Nonviolence, Religion, and Peace Lecture on October 25 (Thursday) at 11:00 a.m. in the Hesburgh Center for International Studies Auditorium. Sponsored by the Kroc Institute for International Peace Studies, part of the Keough School, Thompson Nahar’s lecture is titled “Flushing Peace Down the Toilet: Strategies for the End of the World as We Know It.” The event is free and open to the public, and it will be livestreamed via YouTube Live. Click here to watch the live broadcast. The question of water and sanitation justice is ubiquitous in the literature about peace, justice, and conflict these days. From Standing Rock to South Africa, people have adjusted their way of life in response to the necessity of water protection and water restrictions. The need for access to water to ingest and the need to release excess water in our system through urination are needs that are familiar to all humans. Even though we do not often address these issues publicly unless there is a crisis, the questions of water use and sanitation rules are central to matters of religion and civilization. The increasing scarcity of clean water has been a driver for conflict and violence. When water and sanitation basic needs cannot be met, this creates grievances that can be mobilized in any population. Moreover, when water becomes unavailable or polluted, human life ways come to an end in that place. What future pressures can we expect here in the water-rich Great Lakes region? What adjustments can we think about now in order to be better prepared for the arrival of the apocalyptic scenarios we see on television news? By rethinking our understanding of waste, addressing body-related taboos, and sharing the stories of initiatives that directly tackle this complex issue, Thompson Nahar’s lecture will make a timely contribution to ongoing dialogues on nonviolence, religion, and peace. For additional information about the Kroc Institute, visit kroc.nd.edu.